Therefore lens 2 has a larger maximum aperture than lens 1 and therefore capability to allow more light. But if look at their minimum f/stop values, on the Nikon website, it is 32 for both the lenses. How can the minimum f/stop values be the same for both the lenses? I do not understand this? What is the f/stop then, if not focal length/aperture diameter? "Therefore lens 2 has a larger maximum aperture than lens 1 and therefore capability to allow more light. This is where your understanding is not quite right. The physical size of the aperture is indeed larger in the longer lens, but it does not allow in more light, because the longer focal length means that the field of view is narrower. 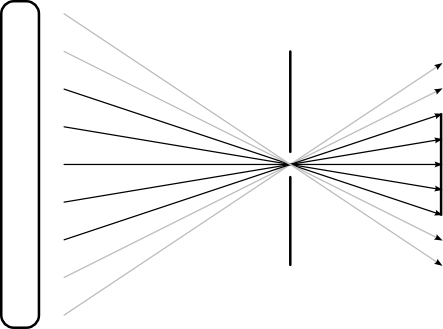 This means that the cone of light entering the lens is also narrower, leading to a reduction in the overall brightness. 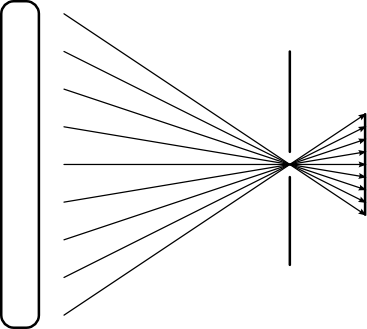 The reason aperture is expressed as a function of focal length is exactly this: so that the same number represents the same brightness. I'm not sure why you think the minimum aperture can't be the same for both lenses, so it's hard to address that point unless you clarify your reasoning. The 105mm lens will have an aperture diameter of ~3.3mm at f/32 and the 60mm lens will have an aperture diameter of 1.875mm at f/32. They will both let in the same amount of light for the reason given above. When people talk about 'aperture' in photography they are almost always referring to the f/stop, not the physical size of the aperture, which is rarely relevant in exposure calculations. Let's consider a simple pinhole camera, taking a picture of a uniformly illuminated wall. Because this is a uniformly illuminated wall, each of these rays represents the same amount of light. There are nine rays hitting the film. Now if we move the film back, we get a narrower field of view. This corresponds to the longer focal length of your 105mm lens. The aperture is still the same size, and there is still the same amount of light (9 rays) passing through it, but because the field of view is smaller, less of it hits the film. Now there are only 5 rays hitting the film. As you enlarge this hole, more light passes though, but you will need to add a lens to focus it if you want a clear picture. However, the basic principle still applies: a longer lens or a narrower field of view means you are capturing less of the light passing through the aperture on the film. Somewhat confusingly, "f" is the focal length, and "N" is the f-number. But it's less confusing if you recall that f-numbers are usually written with a "f/" prefix, as in "f/4". What this means is "the aperture's effective diameter is the focal length (f) divided by 4: f/4". 1: effective because the physical size of the aperture may be modified by the optics around it, and exactly where in the optical path the aperture is. Not the answer you're looking for? Browse other questions tagged aperture terminology focal-length f-stop or ask your own question. Do bigger focal lengths capture more light? How to fix stuck aperture?